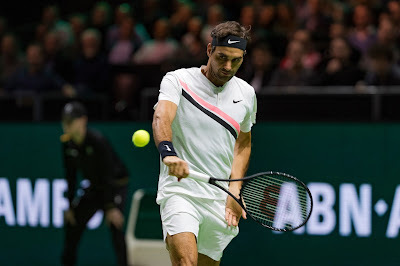 Roger Federer moved to within one victory of becoming the oldest man to take the World No.1 ranking on Thursday with a hard-fought 7-6 (8), 7-5 victory over Germany's Philipp Kohlschreiber at the Rotterdam Open. The 36-year-old will now face Robin Haase in the quarter-finals on Friday. Federer, the 20-time Grand Slam title winner, then eased to victory in the 12th game with a volley winner on second match point. The Swiss superstar must now defeat Dutchman Haase, who beat Griekspoor 6-4, 6-0 in the final match of the day, to return to the summit of men’s professional tennis for the first time in more than five years. Federer, the 2005 and 2012 champion, is excited about the possibility of returning to the top of the rankings 19 years after he played Rotterdam in 1999 on his first career wild card. “This is an exciting challenge, I've struggled to try and get there. I had to win a lot of matches last year,” said Federer, who was world number one for the first time in February 2004. However, he was last at the summit in October 2012 and slumped to 17 in the world in January last year.